In the fall of 1964 following a football game at St. Francis Xavier University in Antigonish, NS. four gentlemen (Don Loney head football at St. F.X., a friend of his Phil Carr-Harris, Peter Gorman Sr., a Toronto businessman whose son was a quarterback at St. F.X. and Bill Rodda, a friend of Gorman Sr.) were enjoying a post-game beverage and discussing football in general and university football in particular. The CIAU had initiated National Championships in Men’s Hockey and Basketball the previous year, and all four men felt that football should have a national championship as well. And so an idea was born. The CIAU, both financially (travel costs) and philosophically (eligibility rules , egos, turf) was not ready for such a move and so Gorman, with an indomitable positive attitude, on his return to Toronto, began to develop a different scenario. He would create an annual invitational championship game with a recipient charity and guaranteed travel costs for the two teams, selected by a national panel, to play for an as yet unnamed trophy. In short order Gorman incorporated the event as The Canadian College Bowl, pulled together a group of Toronto business acquaintances to serve as the directors of the Bowl Game who would guarantee to cover expenses for the game. Next, he approached The Canadian Save The Children Fund, with which he was already heavily involved to serve as the recipient charity of the game. Having received that commitment Gorman then approached Governor-General Georges P. Vanier, who was already the official patron of the Save the Children Fund (CanSave), and asked if the GG would agree to have the Championship trophy named in his honour. The Governor-General agreed and Gorman had 90% of his package. The final piece of the puzzle would be to take this to the CIAU and ask for their endorsement. The CIAU agreed, especially since it would have the opportunity to name its own committee to liaise with Gorman’s group and in particular to serve as the panel of experts that would select the two participating teams each year. 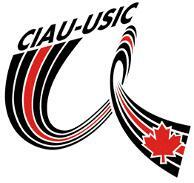 Faced with a proposition which would increase the profile of the fledgling organization, add another championship to its slim portfolio at no cost, and with a major role in the selection of teams, the CIAU accepted Gorman’s proposal and so began the flagship of all Canadian University Championships. By 1967 the CIAU had overcome many of the earlier hurdles to such a move and in Canada’s Centennial year The Canadian College Bowl became Canada’s University Football Championship. In 1982 the CIAU did not renew its agreement with The College Bowl Committee and assumed full control of the event and renamed it The Vanier Cup. The Vanier Cup was played in Toronto, Ontario, from its inception in 1965 through 2003. However, after the CIS opened the game to host conference bids in 2001, the possibility arose to have games held outside Toronto. The 2004, 2005 and 2008 games were hosted by the OUA at Ivor Wynne Stadium in Hamilton, and the 2006 game was hosted by the University of Saskatchewan at Griffiths Stadium in Saskatoon. Four times, the game has been played in the same city and during the same weekend as the Grey Cup: 1973, 2007 and 2012 in Toronto and in 2011 in Vancouver at BC Place Stadium. The Vanier Cup is played between the winners of the Uteck Bowl (formerly Atlantic Bowl) and the Mitchell Bowl (formerly the Churchill Bowl). The Uteck and Mitchell Bowls, in turn, are contested by the Loney Bowl (AUS), Hardy Cup (Canada West), Dunsmore Cup (RSEQ), and Yates Cup (OUA) champions. The 2009 and 2010 games were held at Laval University in Quebec City, making it the first time the province of Quebec hosted the Vanier Cup. As of 2011, 40 of the 47 Vanier Cups have been played in Toronto, three elsewhere in Ontario, two in Quebec, one in Saskatchewan and one in British Columbia. No games have been staged in the Atlantic region. The game is regularly broadcast nationally. From 1965 through 1976 it was broadcast on CBC Television, from 1977 through 1988 it was broadcast on the CTV Television network. In 1989 the game went to Cable TV with TSN taking the game through 2007. In 2008 it was on the cable network The Score, before returning to TSN from 2009 to 2012. In 2013-15, the game was broadcast on Sportsnet. In November 2010, the rights to the Vanier Cup were purchased by sports marketing company MRX. The 2011 game was held in Vancouver, on the same weekend as the 99th Grey Cup and for the first time it was fully integrated into the Grey Cup Festival as a festival event. In 2012, the 48th Vanier Cup, played between Laval and McMaster at Rogers Centre in Toronto became both the most attended and most watched Vanier Cup ever. Held the same weekend and in the same city as the 100th Grey Cup, the game was attended by 37,098. The previous record was set in 1989 at the 25th Vanier Cup, when 32,847 watched the game between Western and Saskatchewan that was also played at SkyDome (now Rogers Centre). The game, broadcast on TSN and RDS was watched by 910,000. Jeff’s history with College Bowl and Vanier Cup dates back to 1978 when he was a committee member on the College Bowl Festival, organized by the Toronto Junior Board of Trade. In 1979 he was Executive Vice President of the Junior Board, and its representative on the Canadian College Bowl Board. In 1980 he co-chaired the College Bowl Festival with Jim Barnett, and following that, continued to volunteer with the Festival Committee. In 1988 he rejoined the Vanier Cup Organizing Committee, and in 1997 led a McKinsey & Company pro bono project for the CIAU to reshape the vision and strategy for the Vanier Cup. 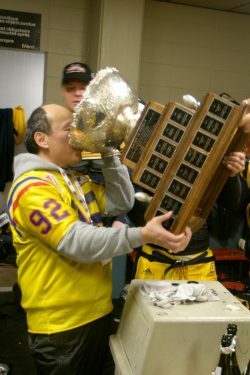 Immediately following the completion of the project, whose recommendations were approved 100% by the CIAU Board of Directors, Jeff served as its Chairman from 1997-2000 (co-chaired the 1997 Vanier Cup with Jamie Bone). He relinquished any formal involvement with Vanier Cup in 2001, the year he began to photograph the Queen’s Golden Gaels Football team. Here are his Vanier Cup photos .